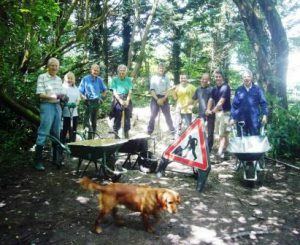 We are a dedicated group of like-minded individuals who care very much for Storrington’s environment and we take practical action to improve it for both people and wildlife. We are delighted to announce that we have completed the river bank restoration project we started back in the spring at Fryern Dell. 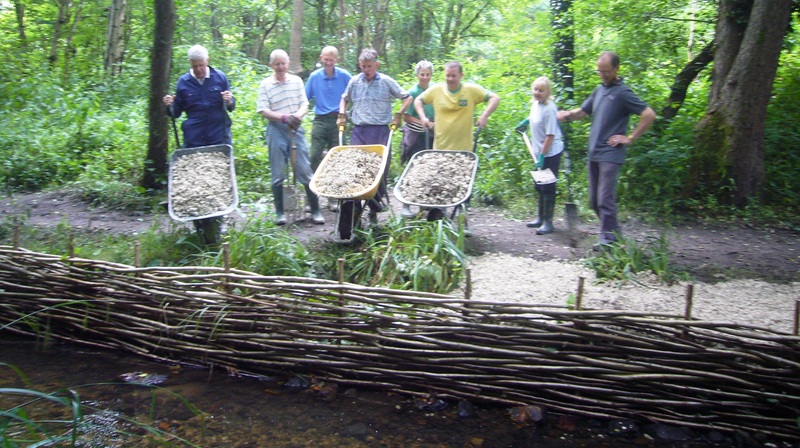 The project involved our volunteers in weaving a Hazel fence along the worst eroded sections of riverbank and backfilling with crushed chalk. In doing this we have not only prevented the serious erosion problem but also improved what was w very muddy section of footpath. Many thanks to all of our volunteers who worked so hard to achieve such an excellent result. 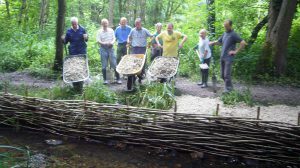 Undertaking a variety of conservation projects such as pond management, tree planting, footpath and management. Achieving over 5,000 volunteer workdays in making Storrington a better place for its people and for wildlife. Raising awareness of wildlife related issues at our periodic lunchtime talks. Establishing and co-ordinating a weekly programme of Healthy Walks in and around Storrington. Being one of the major voices in convincing the District Council to build the Riverside Walks and carrying out the major refurbishment of the Mill Pond.